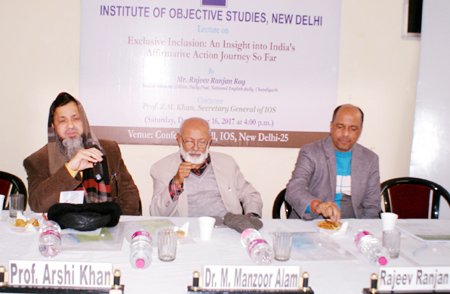 The Institute of Objective Studies (IOS) organised a lecture on “Exclusive Inclusion: An Insight into India’s Affirmative Journey So Far” at its conference hall on December 16, 2017. 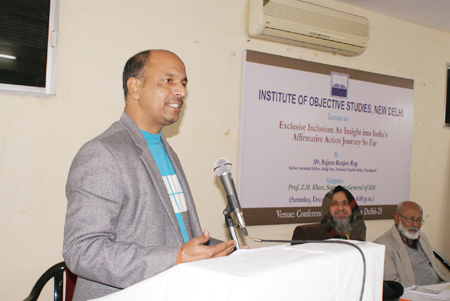 Delivering the lecture, senior assistant editor, Daily Post, Chandigarh, Rajeev Ranjan Roy warned that if the majority of the people were excluded from the process of inclusive growth and kept dependent on freebies, the country would not grow. Sooner or later, the country would have to pay a price in the form of destruction of national fabric if effective corrective measures were not initiated. He added that the Constitution was the foundation on which to build an India of everybody’s dreams, and not an India which was exclusively meant for the creamy layer of citizenry, while others were left to fend for themselves. What India had been able to achieve by way of development had come after systematic exclusion of the poor, mainly Dalits, OBCs and minorities, from the process of political, economic, academic and social empowerment. He observed that when inclusive growth was exclusively meant for the elite, leaving common people in the lurch socially, educationally, politically and economically, then India would never become a strong nation even with its vaunted nuclear power. Roy held that the government’s indifference to these communities stemmed from the belief that if they were educated policy formulations would have to be changed in order to accommodate them. This would create a lot of problems for the policy planners. This was best illustrated by the fact that the number of teachers in universities and colleges had remained static for years. He said that vice-chancellors of almost 85 percent universities belonged to castes and classes other than 80 percent of population. He said that Gurgaon (renamed as Gurugram) in Haryana, on Delhi’s border, was a highly developed town in several respects, but the adjoining Mewat area was most backward, for the inhabitants there were Muslims. He maintained that the majority community’s mind had been poisoned to the extent that patriotism was weighed against religious persuasion. “If one was a Hindu, he would be regarded as patriotic and, if he happened to be a Muslim, he would have to prove his patriotic credentials. He scoffed at the suggestion that possessing a mobile phone or a TV set symbolised progress, adding that these consumer goods had, in fact, increased poverty. He said that the basic indicator of progress was every citizen’s access to education, healthcare and other civic entitlements. It was the duty of the state to give equal treatment to every citizen irrespective of his or her status, he added. The convenor of the programme, Prof. Arshi Khan of department of political science, AMU emphasised the need for preserving the diverse democratic and national values. He said that all-out effort would have to be made to ensure that no one was left out of benefit of economic growth. It was a matter of concern that the benefit of development were being cornered by a small group. This trend would have to be reversed if inclusive growth had to be sustained. 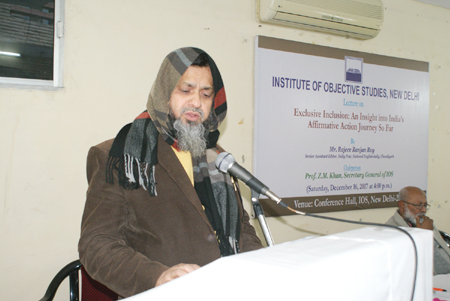 Muslims were denied the benefit of reservation and lagged behind in every field of activity. Now they had become more backward, he concluded. 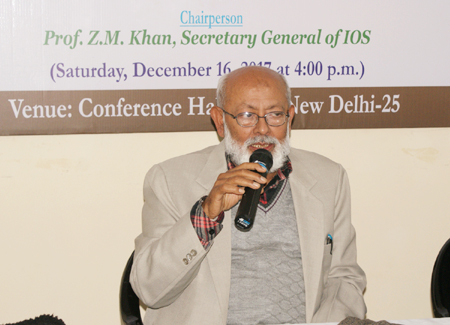 Presiding over the programme, the chairman, IOS, Dr. Mohammed Manzoor Alam, underlined the need for protecting democracy and democratic institutions, including the right to dissent for a vibrant Indian polity. Commenting on the prevailing socio-political climate in the country, he said that people could not muster courage to raise their voice on the issues that mattered to them. Such a state of affairs needed to be thoroughly gone into by all the stakeholders. Laying stress on the need for regular communication among all stakeholders, he cautioned that the prophets of doom were out to divide the society as also the country along caste and religious lines. He pointed out that a vicious propaganda campaign had been launched to tear the country’s secular fabric which formed part of India’s composite culture. He added that fraternity, justice and equality had become a casualty as the powers that be were systematically destroying them. More significantly, the voice of dissent was being choked, he said. Earlier, the lecture began with the recitation of a Quranic verse by Hafiz Athar Husain Nadwi. The lecture was attended by several university teachers, research scholars, mediapersons, social activists and prominent citizens.